Composed by Ferdinand David. This contest and recital favorite is newly engraved, edited from the original edition with extensive notes by Justin Tokke. 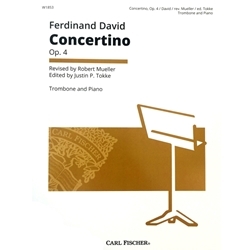 The editor calls David's Concertino "a prime example of mid-nineteenth century romanticism in Germany. Heroic rhythmic gestures combined with beautiful lyrical sections." Published by Carl Fischer.